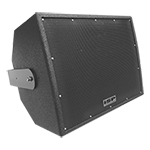 The ISP Technologies’ powered CX series coaxial speakers are high performance coaxial speakers offering a new level of performance not typical with a coax design. Based on a new generation of high performance coax drivers, the CX Series cabinets are available in both fully weatherized cabinets with external rack mount amplifiers, for outdoor applications as well indoor use. The cabinets incorporate precision matched active crossovers and equalization thus delivering high SPL with amazing fidelity and superb midrange performance. Both the CX114i and CX110i provide the advantages of coaxial speakers which provide more precise off axis response in all directions due to accurate spectral response arrival time. The CX™ series deliver the same fidelity and clarity that ISP has become well known for and are a great choice where outdoor high performance sound is required. The CX114i-W and CX110i-W are full weatherized versions built with exterior grade 18mm Baltic birch plywood, fully sealed with a polyurea spray on finish with UV protection, hot zinc dipped and powered coated grills with stainless steel screws and hardware, weatherproof speakon connectors and stainless steel mounting bracket. Weight: 45 lbs (50 lbs with bracket). Materials: Exterior grade 18mm Baltic Birch Plywood with black rubberized polyurethane coating. Bracket is stainless steel with black powder coat finish. Stainless steel screws and bolts. Grille is steel with black powder coat finish and foam backing.